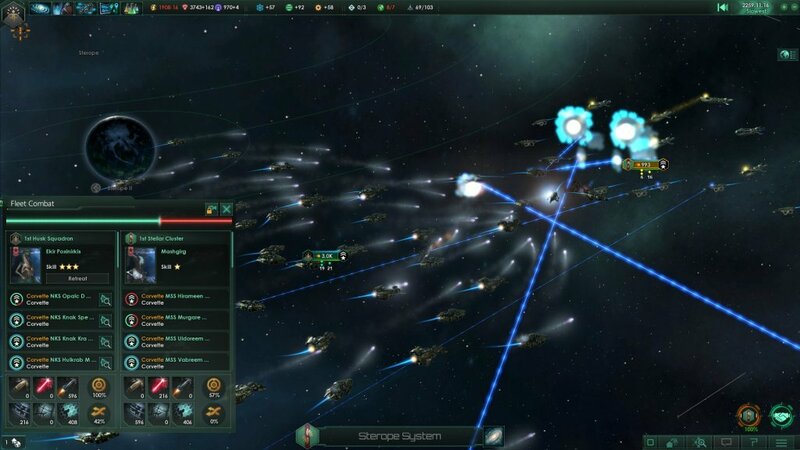 Stellaris is that type of game that shows no mercy if you make even the smallest mistake and if you’ve played the game at least a little bit, you know that there are a lot of mistakes you can make during a playthrough. The biggest unknown in most cases and one of the biggest challenges in the game is going to war and even more so winning wars. I remember that I was eager to declare my first war during my first playthrough. I had no real idea what to expect or how to do it, so I just maxed out my fleet and declared war to the closest empire. I went straight to their home base laughing at their ships that were attacking my mining outposts in solar systems that I had no troops in. Just a few moments later, after their entire fleet decided to respond to my futile attempts to destroy their planet, I was left with just three ships and it was game over for me. War is difficult and winning them takes a lot more than just clicking some buttons. I am here to share with you my complete guide to winning wars in Stellaris, because you probably need some extra advice. 1. The way you start the game is extremely important! I’ve already shared some valuable tips & tricks on how to start a game, but the short version would be this: research Colony Ships ASAP, Maximize your Minerals & Energy production, Survey as many systems as possible and rush to build your first 4 colonies. I don’t really recommend attacking anybody before you have at least four planets and spaceports (for the extra fleet size). 2. During this time and your rapid expansion, it’s extremely important to focus on researching advances for your military ships. Focus on a single type of weapon and armor and hope that your nearby species are not strong against these. You can even go to slavery in order to increase your outputs (if you get such bonuses from the governments you’ve chosen) and you can also switch to +30% society research in your policies to quickly get colony ships and solve the alien language quests faster. 3. Hoard minerals and make sure that you have enough to rebuild your entire fleet (most likely, it won’t be needed, but having this will surely help). Make sure that you upgrade your corvettes to the latest technology and that they are not weak against the enemy you’re facing. Have in mind that if you have higher numbers, you can still get destroyed by an enemy fleet that has defensive bonuses against your weapons and/or offensive bonuses against your armor/shields. Look for an alien race that has less power than you do. They are the best choice when it comes to winning wars and if you have such a race, you’re almost guaranteed a win if you do things the right way. You can also destroy empires that are similarly powered, but it might be a bit more difficult. So Golden Rule of Thumb: go for the weak ones first! 4. Prepare your defenses. This step might not be needed, but it’s best to be prepared. Check out the routes leading to your planets and the most likely directions from which the enemy might come (easier in Warp and Hyperdrive, a bit more difficult to guess with Wormholes). Build Defensive Outposts there: they won’t destroy AI fleets in most occasions, but they will give you enough time to come and defend your Planets and, most importantly, destroy the enemy fleet. Usually, the one who wins the first major battle will win the war. Alternately, prepare your armies. This is also optional, as your main goal in wars is to get the empires become your vassals and make them part of your empire after the waiting period (usually 10 years). If you won’t do this, although this is the best method, you need to complicate things by training armies to attack their planets. 5. Declare the war and instantly go on the offensive. Pause the game and prepare your moves. The AI will react almost instantly, but if you have the upper hand, you will win. Try to go for their fleet and destroy it – at the same time making sure that you rebuild the Corvettes you are losing – use all Starports to do that to have them ready faster. Ideally, you should draw the enemy in near a Defensive Outposts, but usually it won’t happen. Just charge them and make sure you win your first conflict. Retreat, repair, refill and attack again: this always gives you the upper hand. If you have this option, start destroying their mining facilities. Go for minerals and energy only to make it impossible for them to rebuild their fleet. Finally, if they don’t come up with a peace offer, start the diplomacy event yourself and ask them to surrender. I prefer to go the Vassals route and make them part of the empire later on. Enslave all the Pops (you get no penalties this way and there are no risks) and quickly build up a new fleet. Rinse and repeat, always making sure that your Corvettes (I usually prefer them for attacking) are updated with the latest weapons and tech and that they actually have weapons and armor that are strong against the race you’re fighting. This would be it. Wars in Stellaris are really difficult, but with a bit of planning and strategy, you will easily win them all and become the ruler of the universe!